We recently borrowed a trampoline from my brother-in-law. My husband has been wanting to get a trampoline for the kids for awhile, but I have been resistant simply because the kids are still so young. But I knew that a trampoline would be perfect for my oldest who jumps on everything constantly due to his proprioceptive and vestibular sensory seeking needs. So last weekend, my husband spent hours setting up the trampoline and just recently I did a quick dollar store hack to make the trampoline safer for the kids. While setting up the trampoline, I opened what was supposed to be a sealed plastic container holding all of the springs. Instead, I found about two inches of water in the bottom of the container. That means a majority of the springs were rusty. We cleaned off the rust as best we could with some CLR, but we definitely needed to add some extra protection. I certainly didn't want the kids to possibly scrape their limbs on rusty springs. Then my husband reminded me of this simple trampoline safety hack using pool noodles. I remember seeing it all over Pinterest before and I'm not sure who came up with this genius idea, but it is brilliant. Simply brilliant. It was time for me to begin operation: pool noodle protection. I headed to the dollar store to stock up on pool noodles. I ended up spending $20 on 10 pool noodles to do this safety hack. I then used an utility knife to cut the pool noodles to the appropriate length. Then I made a slit on one side so that the pool noodles could slide right over the springs. My kids helped out by putting all the pool noodles on the springs. They even arranged the pool noodles into a colorful pattern. Once all the springs were covered, we pulled the mats back over top and secured the mats to the frame of the trampoline. Double protection, no exposed springs, and yet, such a super easy and inexpensive hack! That's genius! 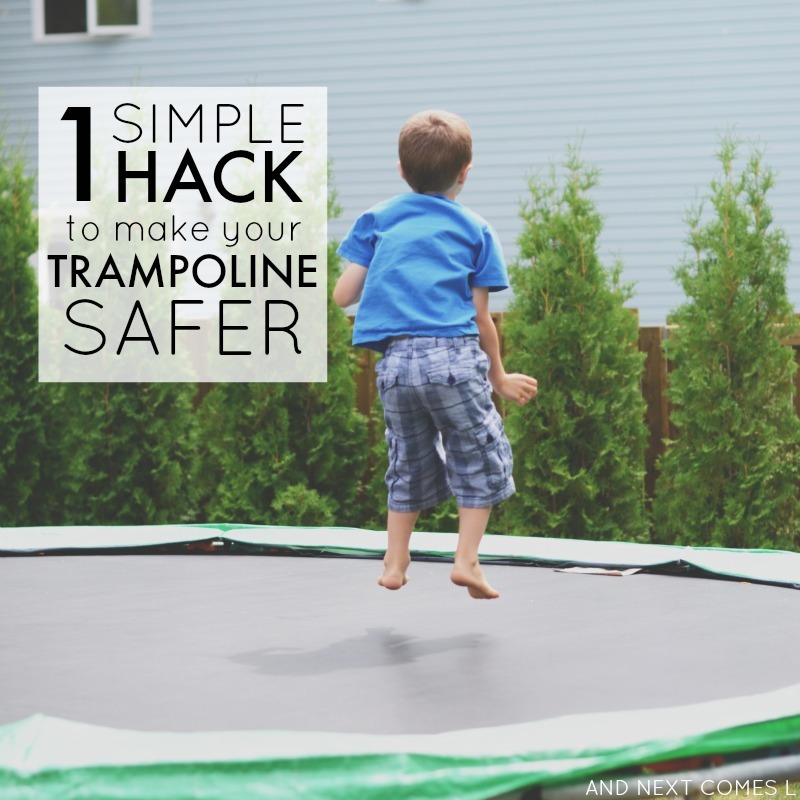 My daughter loves to jump on the trampoline but any way to make it a bit safer is great by me! I agree! An extra little bit of safety is always great.